Riddle make you think and there are many riddles which will make you think out of the box. Here are some out of box thinking riddles which will twist your mind. Some of these riddles are very Logical, which some of the Riddles are Mathematical. There are some quick Riddles which are for fun. Do try to answer these riddles as quickly as possible. 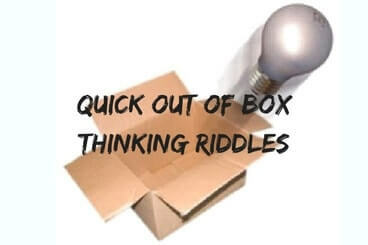 Let us see how much time you take to solve each of these quick out of box thinking riddles. Four fathers, three grandfathers and four sons go to the theatre. What is the minimum number of tickets they need to buy? A cat, a monkey and bird and racing to the top of the mango tree. Who will get Banana first? One Electrician and a doctor went to watch a movie. One of them is the father of the other's son. How could this be possible? What comes in every Minute, Twice in a moment, yet never in a thousand years? 4. Four persons Peter, Tom, Harry, and Shally read a book turn by turn. Harry reads just before Peter. Tom reads after Peter but before Shally. a. Who does read the book first? b. Who does read the book last? Pointing out to a girl Rahul said: "My uncle is the uncle of this girl's uncle". How is the Rahul related to that girl? A fellow encountered a bear in a wasteland. There was nobody else there. Both were frightened and ran away. Fellow to the north, bear to the west. Suddenly the fellow stopped, aimed his gun to the south and shot the bear. What colour was the bear? 1. Out of Box Thinking Fun Brain Teasers: Here you can find many Out of Box Thinking Brain teasers which will twist your mind. 2. Easy Mathematical Brain Teasers: It contains an easy Mathematical Brain Teaser for Kids and Teens. 3. Simple Fun Brain Teasers for kids with Answers: These are the brain teasers which are created by kids. These brain teasers can be easily solved by kids but adults will take a lot of time to solve these brain teasers. Anyway, irrespective of your age, you should try these brain teasers. 4. Mind Twisting Out of Box Thinking Brain Teasers: These are very interesting mind twisting brain teasers in which at first sight you may think that there is no solution for these brainteasers. However, if you start thinking out of the box then you will be able to solve these brain teaser easily. Here is the answer to 19th Brain Teaser Question of the post titled "Out of Box Thinking Fun Brain Teasers with answers to Challenge your Mind ".